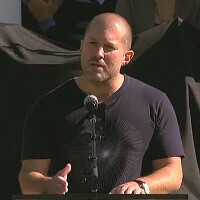 Last Wednesday there was a private memorial service for Steve Jobs on Apple's campus. Among Norah Jones and Coldplay performances we saw people like Al Gore taking the stage and sharing their thoughts on Apple's long-time inspirational leader. One of the speakers who chimed in was Jonathan "Jony" Ive, the man behind all things Apple design, who spoke about his love-hate relationship with Steve Jobs. He [Jobs] will go through a process of looking at my ideas and say, 'That's no good. That's not very good. I like that one.' And later I will be sitting in the audience and he will be talking about it as if it was his idea. I pay maniacal attention to where an idea comes from, and I even keep notebooks filled with my ideas. So it hurts when he takes credit for one of my designs. Jony Ive, however, was well aware that Steve's strongest point was the ability to drive through the clutter of ideas, pick and choose the ones that fit Apple's vision and dismiss others, even great ones, in order to create the coherent experience that is now across Apple's products. Ultimately, his vision made Apple the largest company in the world by market cap. Jonathan Ive thought that portraying Steve Jobs as the only idea man of the company can ultimately hurt Apple, and now he has the chance to prove it wasn't so, so CEO Tim Cook better do all in his powers to keep him on board. Not that there is an abundance of places at the same level he could go anyway. His speech starts about 48 minutes into the video below. Oh, Ive could find one or two places to go outside of Apple. Just across town in Mountain View is a search engine company who would be more than happy to give Ive a home.... I completely agree that Ive is one of the key players for Apple's future. Apple's Board of Directors had better give him a similar kind of golden handcuff package that Tim Cook got. so ol SJ even stole from his lead designers and pretended they were his ideas. seems par for the course at this point. I believe I asked an author on this website, "How do you know Steve Jobs was primarily responsible for the iPod, iPad, iPhone, iTunes, etc.?" And the question was met with derision. Here goes a story, describing vaguely, how Steve Jobs, "the Genius" could potentially have usurped an Apple employee's ideas as his own. A rudimentary understanding of how organizations and research & development operate, would make it absurd to believe that the CEO is primarily responsible for all the inventions of a several thousand employee sized-corporation. Read his book and you'll see he had a huge hand in the final product. I think it's ridiculous people like remix and sniggly deride him for not inventing everything at Apple. No one builds a product by themselves. You need a team of people contributing ideas.